German M 1888 Commission rifle. s# F 84937 on guillon. Very rare German modification of a French M 1874 Gras bayonet to fit the German M 1888 Mauser rifle. Excellent T-shaped blade with Mre. 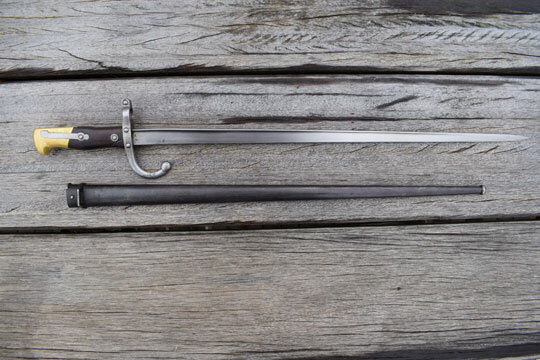 d'Armes de St.- Etienne 8'bre 1876 on blade spine and two French inspection marks on ricasso. Excellent modified hilt with brass pommel and wooden grips. By grinding away the upperpart of the brass pommel, is the depth of the slot reduced. Modification included bending the blade slightly downwards from about 50 mm. away from the crossguard and enlarging the muzzle ring by 2,5 mm.modified muzzle ring MRD 17,4/23 mm. Excellent bright crossguard with quillon. There are three more Frence markings on the quillon. Excellent blued metal scabbard with no dents. Very rare altered bayonet in an excellent condition.